I’d like to think that after over four years of marriage Vishnu and I are pretty good communicators and generally know what we each need to do to keep our household running. But then out of nowhere, a great idea presents itself. When my sister and her husband came over for dinner the other night, they talked about their weekly marriage meeting. This is something they recently implemented to stay on the same page every week. With two incredibly demanding schedules, it’s easy to focus on work and put your marriage and essential tasks on the back burner. Especially as newlyweds. Personally, this is right up my alley. 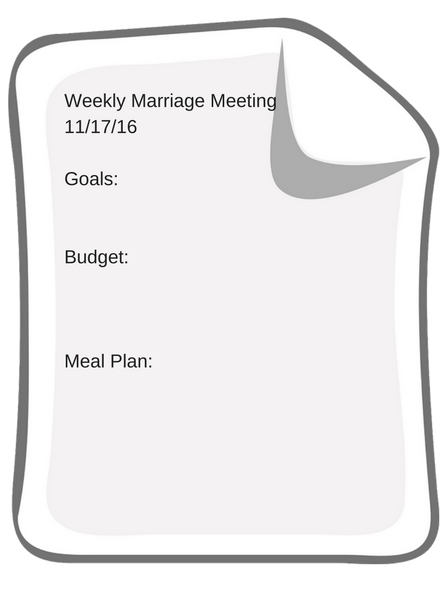 I love setting (and achieving) goals, meal planning, etc. Even if you’re nothing like me, hear me out. Relationships are hard work and require special attention. I think that’s something we can all agree on. I also think we can agree on the fact that it’s easy to take your significant other for granted every now and again. It’s not intentional of course, but when you see each other everyday, it’s easy to make everything but your love a priority. These meetings help avoid that! If you’re still not convinced, how about this – your relationship is like your job. It requires you to set goals, check in regularly, acknowledge what’s working well, provide constructive feedback, etc. A good friend said this to me once, and it really stuck. I would never let my responsibilities at work to fall to the wayside, so why would I do that to my most precious relationship. Am I right or am I right?! Anyways, now that you’re convinced that you and your significant other need to hold weekly meetings, here are a few ground rules to ensure your meetings are productive. Schedule your meetings so that everything else revolves around them. And don’t cancel! Put your phone and anything else that could prove to be a distraction away. Sit together. Side-by-side. It’s more intimate! Always keep an open mind and frame everything in a positive way. This is not the time to bring your grievances to the table. Schedule a separate meeting for that! In all honestly, Vishnu and I did a lite version of this for a couple of weeks (and actually enjoyed it). We didn’t follow rule #1 so that’s probably why the concept didn’t stick. But with a new year upon us in a few short weeks, I’m ready to bring weekly marriage meetings back. Wish us luck! Do you and your significant other do something similar? What are you tips and tricks for staying on the same page when life gets in the way?